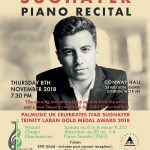 Lord Cope of Berkley is a Trustee of Palmusic UK and has asked that the Anglo Jordanian Society know that they are organising a Concert on Thursday 8th November 2018 to celebrate the achievement of the brilliant young Jordanian/Palestinian pianist Iyad Sughayer. They have organised the Concert for him in celebration of him winning the Gold Medal for 2018 at the Trinity Laban Conservatoire. The Reception afterwards is to allow their best supporters to meet him and to raise money to support their programmes to help young Palestinians in their difficult lives through music. The recital will take place at 19:30 on Thursday 8th November 2018, at Conway Hall 25 Red Lion Square, London WC1R 4RL. Doors will open at 19:00. The reception afterwards for our special supporters is in the Brockway Room at the Hall. Tickets are available at https://thelittleboxoffice.com/palmusic and range from £15 to £90.